Joshua’s eldest son, Joshua Thornton Jr. (J.J.) has graduated at the top of his class from law school and is returning home to spend the summer studying for the bar exam. However, to Joshua's and Cameron's shock and dismay, J.J. decides to move into the main house at Russell Ridge Farm, the largest dairy farm in the Ohio Valley, in order to rekindle a romance with Suellen Russell, the lovely widow twice his age. The May/December romance, bonded by a love for music, between the symphony conductor and young musical prodigy had bloomed many years earlier. ​The move brings long buried tensions between the father and son to the surface--not the least of which being J.J.'s inexplicable dislike for his stepmother Cameron. But when a brutal killer strikes, the Lovers in Crime must set all differences with Joshua's son aside to solve the crime before J.J. ends up in the cross-hairs of a murderer. If you follow my book reviews on a regular basis, you know author Lauren Carr's books are some of my favourite to escape into after a long day. I have read every book in every series. My biggest problem is I devour them and then have to wait patiently for the next one. 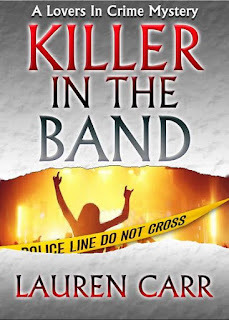 Killer in the Band adds a new title to Carr's Lovers in Crime series featuring Prosecuting Attorney Joshua Thornton and Detective Cameron Gates (they met early in this series and now are married - something at least one of Joshua's kids are not happy about). The introduction to Killer in the Band opens with a flashback to 11 years ago when Cameron was called to the abandoned Dixmont State Hospital. A mummified body with head wounds has been discovered. There is no ID and little to go on. The case quickly goes cold. Then we move to a time three years later where we are introduced to several important characters who put a name to the victim. They chose to stay silent. Chapter one brings us to the present day. 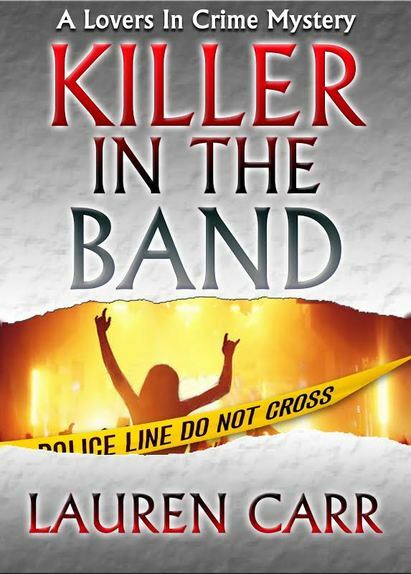 Killer in the Band offers an intricate plot that moves between what is happening in current times and flashbacks where we follow the story of four band members, one who later becomes the murder victim. Joshua and Cameron are drawn into both past and present when Joshua Jr. rekindles his love affair with a woman twice his age - Suellen - the group's former leader. Despite his father's objections, Joshua, Jr. moves in with his love. When Suellen has health issues arise and Joshua Jr. wants to be at the hospital by her side. Joshua Sr. finds himself at Suellen's dairy farm covering his sons chores. Then a brutal murderer strikes. This event leads slowly but surely to the identity of the first murder victim coming to light. Cameron quickly re-opens the cold case. Could Suellen or one of the other band members be the killer in the cold case? The Detective also now has TWO murders to solve - one past and one present. The question arises, are they tied together in some way? Could the killer be the same in both? The threat of new victims occurring creates a sense of urgency. As the story moves forward, past and present begin to collide. And all through this spell-binding story, there runs an undercurrent. 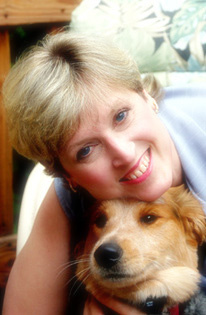 The themes of love, loss, acceptance and hope are subtly woven in. A great read. Can't wait for the next book!